What are the common signs and symptoms of Dermatomyositis? 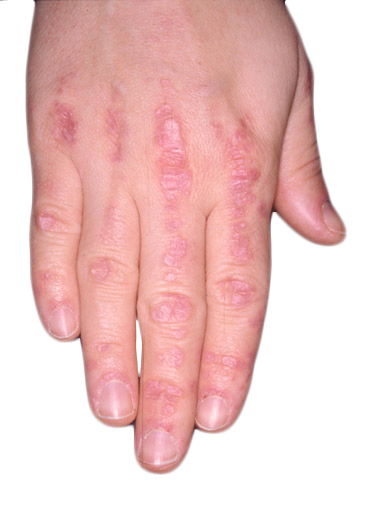 A person suffering from Dermatomyositis may see redness, scaly eruptions on the face, knuckles, elbows, and knees. There may be a rash on the upper eyelids and in rare cases on the lower eyelids as well, often with itching and swelling. Rough, cracked skin at the tips of finger are also seen. The person may feel Muscle weakness. Also, he may feel paralyzed, as if he is unable to walk, run or even get out of bed. Muscle pain, muscle tenderness and fatigue or weakness may also be experienced. One may observe that one’s weight is reducing. One may experience difficulty in breathing while ascending stairs, walking, or even while taking small steps. Homeopathic treatment helps to improve muscle power. It is aimed at a better quality of life, to help reduce muscle weakness and control the disease progression. It helps in reducing redness, itching, pain on the body. It boosts up the immune system. Homoeopathic treatment for Dermatomyositis is absolutely harmless, without any side effects and strongly recommended. Get in touch with us today to ask us how Homoeopathy can help manage your Dermatomyositis. Like hundreds other, you too can benefit from Dr Rajesh Shah’s research based patented Homoeopathy at Lifeforce.